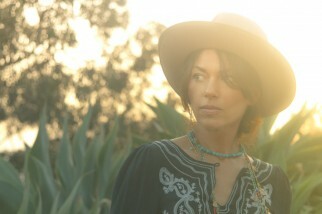 Susanna Hoffs’ new solo album, Someday, is an intensely personal song cycle that doubles as a musical love letter to the music of the 1960s, which, she says, “has always been my reference point for everything.” Produced and orchestrated by Mitchell Froom, the LP is heartfelt and immediate, oozing refinement but without a trace of pretense. On an album full of stylistic surprises, including the summery groove of “This Is the Place,” the evocative “November Sun” and the lilting “Picture Me”, with its Bacharach-style sophistication, lush retro arrangements and modern state-of-the-art production enclose Hoffs’ one-of-a-kind voice in an aural tapestry of velvet and lace. On a chance meeting at a Ron Sexsmith/Caitlin Rose show at Largo, Hoffs ran into Froom. Though she’d known Froom since he played the signature keyboard riff on the Bangles’ “Manic Monday,” they hadn’t worked together since those 1986 sessions. When Hoffs told him about her new material, Froom said he wanted to hear it. She assumed he was just being polite, but he called three days later, so she and Brassell went to his studio with a couple of guitars and played the new songs for him; they had no demos. When he heard the songs, Froom asked if he could produce the album. Elvis Costello’s Imposters rhythm section—drummer Pete Thomas and bassist Davey Faragher—played on the initial sessions in June of 2011, with Val McCallum and Brassell playing guitar. A few of the songs were tracked with Michael Urbano on drums and Bob Glaub on bass. Froom played keyboards throughout the recording. When it comes to collaborating, Hoffs is no novice. Prior to co-writing with Brassell, she’d done a variety of projects outside of the Bangles, writing and recording with Mark Linkous of Sparklehorse, blending her voice with those of Jenny Lewis and Chris Robinson on Gary Louris’ 2008 LP Vagabonds, singing on David Byrne’s “Wild Wild Life,” and covering Dylan’s “I’ll Keep It With Mine” (inspired by Nico’s recording of the song on Chelsea Girls) and the Velvets’ “I’ll Be Your Mirror” on the Rainy Day album, produced by David Roback (who went on to form Mazzy Star. ), and most recently an enduring collaboration with indie pop icon Matthew Sweet on their Under the Covers series. Hoffs goes on to describe her first band with then-boyfriend David Roback as “John and Yoko meet the Beach Boys.” Although they never played any shows, they wrote songs and made recordings that Susanna eventually played for the Bangles. After graduation, she returned to L.A., where she placed an ad in the Recycler, which led to the formation of the Bangles and her 30-year career with them, which was broken by a solo turn in the ’90s, as well as starting a family with film director Jay Roach. Someday is a captivating embodiment of art for art’s sake. As vital as ever at the age of 53, Susanna Hoffs is writing a bold new chapter in an illustrious career—a solo album that encapsulates a lifetime immersed in the arts.